AMEplus experts co-operate with company KGHM Polska Miedz (Copper Smelting-Mining Combine): three mines, the ore enrichment plants, two smelters located in Legnica and Głogów, and Centre Technical Innovation INOVA. This co-operation concerns implementation of the programs to control processes of copper electrorefining, research and development works regarding the optimization of milling processes, the flotation of copper ores and the copper electrorefining were realized. 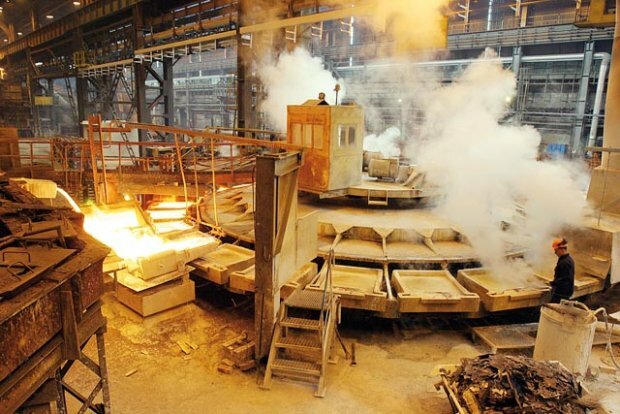 Consortium: Automatyka -Miedz Głogów, AMEplus Gliwice and ELSUR Legnica realize a vast project for Copper Smelter “Legnica” named “System for control and monitoring the copper electro – refining process”. Control systems of processes for milling and flotation in metal ores treatment plants. Control of large powers electric drives (above 1MW). Systems of weighing and balancing raw materials and products in communication with system SAP R/3. Telemetric systems for measurement stations of emission and immision, and reporting systems, in the range of Environment Protection. Identification and positioning persons and technical devices using RFID readers in Mines. Combustion in power boilers and fumes desulphurization. Measurements in fuel base and fuel storage and fuel transportation in fuel base. Generators, compressors and turbo – blowers. Hard coal enrichment and treatment. AMEplus co-operates with Lubuskie Zakłady Termotechniczne “ELTERMA” S.A. Świebodzin. Implementations of complex control systems of technological lines for heat treatment and carbureting are the result of this co-operation. Control systems of processes of heat treatment, which include varied objects and complete technological lines, in this number among others. : quenching and tempering furnaces and spheroidal annealing of bearing rings, quenching furnaces with ENDO atmosphere with control systems of coal potential, quenching tanks, washing systems and dryers, and also chamber furnaces with a protective atmosphere. In the co-operation with company RAFIZ from Wierzbica, AMEplus started multiple building chemistry production lines. The lines control systems supervise the preparing products of building chemistry according to defined recipes for multi-component mixtures and their weighing and packaging. Among the investors of started-up lines we my find the following companies: ALPOL in Końskie , KREISEL in Ujazd and Będzin, QUICK-MIX in Rawa Mazowiecka and companies from Lithuania, Ukraine and Kazakhstan. Control System of MT2, MT3, MT4 Technological Lines Used to Building Material Production. Control System of Technological Line Used to Building Material Production Together with Recipe Base Management. Testing Station of Car Break Systems. Filter Press Control in Sewage Treatment Plant. Control and Monitor System of the warmth knot. Remote Control and Monitor System of Pumps, Water Intakes and Water Objects. Control and Monitor System of Fluid Materials Storeroom. Control and Monitor System of Owipian Installation. Control and Monitor System of Sewage Treatment Plant. Monitor System of Structural Shape Mill. Modernization – Control of grinding and flotation processes. Control and Monitor of quick flotation processes. Control of grinding and flotation processes. 0, 9 -1, 8 MW Drive Control of Sphere Mills. Sifters Control next to PII Shaft. Modernization – Monitor System of concentrate drying processes. Monitoring of gas consumption with MACMat communication. Survey stadion of railway wagon breaks set. The control system of technologic line production of building materials. The reparations- reports system for carbon transformation department in LW Bogdanka. The control and monitoring system of patrol basis. The monitoring system of technologic line in ZPMW – preparation station. Monitor System and Management of Recipe Data Bases for Asphalt Production Stations. The control program and monitioring modification in CBC Gdynia cement faktory. Underpressure Control System in WLM 2.5 Boilers. Tension and Deformation Monitor System of Formation in Power Plant “Dychów”. The monitoring of model-type mass mixer. The visualization and archivisation of termal transformation int the AT-500 technology line on the basis of furnace set. The analysis of the PLC/MMI system propriety of the CO2 compressor.